The Black and Decker LSW20 is an excellent lightweight leaf blower to clear debris and leaves from around your home. The beauty of this Black and Decker LSW20 is that it only weighs 3.7 lbs, making it super easy to carry around and get the job done without straining your body. Another great feature is the fact that it’s powered by a 20V MAX lithium-ion battery meaning you have complete freedom of movement and no gas fumes to worry about. 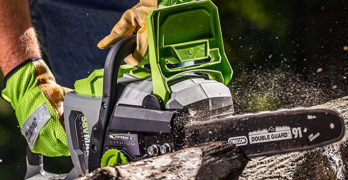 Also, the 20V MAX battery is interchangeable with any Black and Decker tool that shares this system, making it convenient if you already own other Black and Decker tools. Lightweight enough for anyone to use. It’s designed to be relatively quiet and easy to just pick up and use whenever you need to, without any hassle. The one consistent comment from customers is that they recommend you buy an extra battery to ensure you never run out of power while working with the black and decker LSW20 leaf blower. I always recommend buying an extra battery anyway, so I’ll reaffirm what many customers are saying. There are two different batteries you can purchase: Black & Decker LB2X4020-OPE (4.0 Ah), which lasts twice as long as the regular battery or the replacement battery: Black & Decker LBXR20. This is a very well-received (and reviewed) product from customers as it has over 550 reviews and a rating of 4.2 (out of 5). I can see why. This is the perfect leaf blower for homeowners as it combines a multitude of useful features that consumers appreciate, such as: ergonomic design, easy to use with minimal effort, it’s quiet, lightweight and powerful — overall a great leaf blower for well under $100. You can’t go wrong with this Black and Decker LSW20 if you’re on the hunt for a power sweeper for clearing driveways, sidewalks, decks, garages and other hard surfaces of leaves, grass clippings, and other lawn debris. Customers claim to get about 20 minutes on one battery charge so if you feel that you’ll only be doing small jobs then the packaged battery should suffice but if you intend to do a lot of cleaning and debris clearing with the Black and Decker LSW20 then I wholeheartedly recommend you purchase the Black & Decker LB2X4020-OPE (4.0 Ah) battery so you don’t have to stop to recharge. Black and Decker Fast Charger with Flash Charge. Another useful option that you might find useful is the Black and Decker Fast Charger with Flash Charge (L2AFCBST). What it does is charge your battery in in 40 minutes or less — Also, if you’re close to completing your task but need a little more battery life it will charge your battery to 30% capacity within 10 minutes with its Flash Charge. Impressive, don’t you think? Either way, the beauty of Black and Decker is they provide you with several convenient options. It’s up to you whether you need them or not but it’s nice to know that they’re available if you happen to need them in the future. Black and Decker LSW20: A very well designed product, and very affordable. Advanced design allows easy clearing of debris from hard surfaces such as: patios, decks, walkways, driveways and garages. Powerful 20V MAX* Lithium Ion battery provides long battery life and fast charging. Lightweight at 3.7 pounds making it easy to handle. Compatible with the Black & Decker 20V MAX* System. 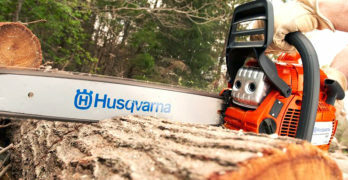 Convenient built-in scraper helps loosen debris or wet leaves from the ground you’re clearing. There are many different leaf blowers to choose from on the market; from gas to electric and the most convenient of them all is a battery operated leaf blower. The Black and Decker LSW20 gets a lot of things right with it’s compact design, and lithium-ion battery system. As far as versatility goes this model ticks all the boxes. 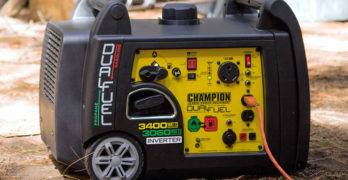 The only downside is the battery life is limited and it’s not meant for heavy-duty leaf and debris clearing but for homeowners it’s perfect and you can solve the limited battery life by purchasing and extra battery of the fast charger. The choice is yours, but I wholeheartedly recommend the Black and Decker LSW20 leaf blower for light to medium duty leaf and debris clearing around the home. Discontinued. Visit Black and Decker to learn more. I’m currently (was) working on a review for Black & Decker LH5000 LeafHog which is impressive in it’s own right. It’s more than just a leaf blower, as it’s designed as a three-in-one power tool: It’s a blower, vacuum, and mulcher — able to tackle almost any job around the house, keeping it free from yard debris. Oh, and it’s electric so you’ll have an extension cord to deal with but you’ll get used to it. Black & Decker LH5000 LeafHog: A blower, vacuum and mulcher. Wow! 3-in-one power tool: Blower, vacuum, and mulcher. Blow speed of up to 240 MPH; 385 CFM air volume. Variable speed switch gives you control over the speed. Includes a tube with LeafBlaster nozzle, vacuum attachment with tube, zipper-less leaf bag, adjustable shoulder strap, and air concentrator.